The fact that you stand behind work for five years and I can call and count on you coming in a reasonable as possible time depending on the problem. I know that there may be cases when you are considered more expensive, but with the guarantee given with the service I don’t feel the cost is unwarranted. Phyl T.
It’s been 99 years since a total solar eclipse passed through the United States. This Monday, August 21, the moon will cover 80% of the sun in Frederick County. It’s a once in a lifetime opportunity for children and adults to experience, so try to be outdoors when it happens — if you have safe viewing glasses of course. For viewing safety advice from NASA, click here. Because looking directly at the sun can damage the eyes, it’s important to watch through special-purpose solar filters such as eclipse glasses that are CE and ISO certified or special filtered telescopes. Make sure the glasses you have are either Rainbow Symphony, American Paper Optics, Thousand Oaks Optical, TSE 17 or Baader Planetarium. Don’t look up at towards the sun before looking through a solar telescope or wearing the eclipse glasses. You must not uncover your eyes from a solar lens at all during the eclipse. When you’re ready to remove the glasses, look away from the sun and then take them off. And don’t look through a camera, a traditional telescope or binoculars — they can all still damage your eyes. 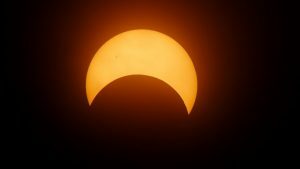 When Will the Solar Eclipse Happen in Frederick County? The peak time that the moon will be cover the sun will be at 2:43 pm. The moon and sun will first “touch” at 1:18 pm and will part ways at 4:02 pm. Urbana Regional Library: From 2:30-3:30 pm in the Anthony M. Natelli Community Room, you can watch the eclipse with safe solar glasses provided, while supplies last. Maryland Science Center Observatory: From 12-4 pm there will be a party for safe viewing. The party is free with admission to the science center, and includes sun-themed activities for families. All of us at Putman Plumbing hope you enjoy the eclipse. Be safe and spend the day with your family. Call us if you have any plumbing problems!